Higher-than-average rainfall last week, in the midst of an El Niño winter, has raised concerns about landslides and mudslides in Monterey County. And those concerns are warranted. Although dangerous landslides have not been witnessed in the area this year, historically January and February is prime time. More than 60 percent of landslides happen in those months, when enough rain has been sopped up by the ground to loosen the soil, said John Stock, a U.S. Geological Survey landslide expert in the San Francisco Bay Area. There are a few key elements for landslides: gravity and water. After four years of drought, the soil might take a little longer to be saturated by rain, but is still vulnerable. “Weak rocks and steep slopes are the main factors, and they’re helped by rainfall,” said Chris Wills, a geologist for the California Geological Society. Geologists have identified two varieties of landslides and debris flows: a fast-moving kind and a slow-moving kind. 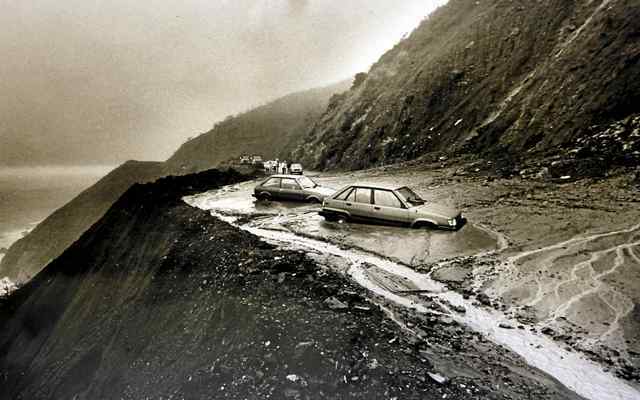 Fast-moving landslides tend to occur during or shortly after intense rainstorms. The soil acts like a sponge, soaking up water in its pores until no more water can be absorbed. Then the freely moving water exerts pressure and pushes the sand grains apart. On steep eroding hillsides, this can generate landslides, spreading shallow soil and rocks downhill. Slow-moving landslides are much larger and deeper, typically happening after a delay — days, weeks or even months after a lot of rainfall has accumulated. Such a landslide occurred in La Conchita near Santa Barbara during the winter of 2005, killing 10 people and damaging dozens of homes. They begin by creeping down slower than at a speed of an inch per year, making them hard to spot. Then they accelerate as massive amounts of earth, boulders and trees tumble down. “Southern Monterey Bay has the most highly erosive beaches in all of California,” said Paul Michel, superintendent of the Monterey Bay National Marine Sanctuary. Continual rainstorms swelled the waters of Carmel River last week. 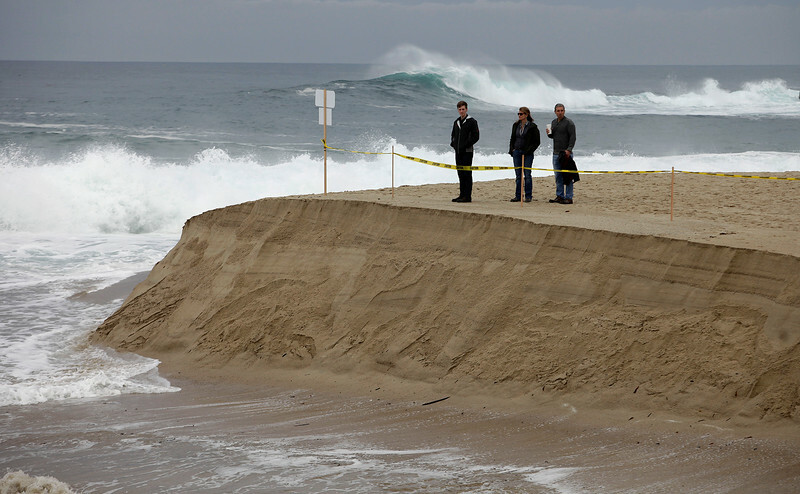 After 10 p.m. Sunday, a sand barrier built to keep the river from breaching at the Carmel Lagoon was washed away, according to Melanie Beretti, program manager at the Monterey County Resource Management Agency. After considering bulldozing sand back in place, officials expressed concern about it just getting flushed out to sea, so they decided to hold back. “We need to balance when and how to utilize the sand,” Beretti said. The beach has been reopened to visitors, and the Resource Management Agency and National Oceanic and Atmospheric Administration continue to monitor the situation to protect the steelhead trout habitat in the lagoon.